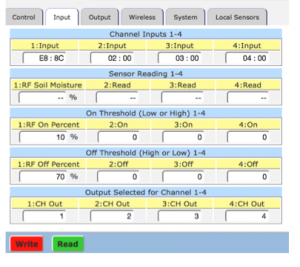 At our R&D center in the historic Whitinsville mill, we put together a short video demonstrating how to automatically start an irrigation pump using the IAS XR3000 and an RF90 wireless soil moisture sensor. This same method using IAS XR3000s and RF90s with soil moisture sensors was deployed at the Community Harvest Project this season to ensure proper irrigation to the hundreds of thousands of pounds of produce grown for donation to local foodbanks. 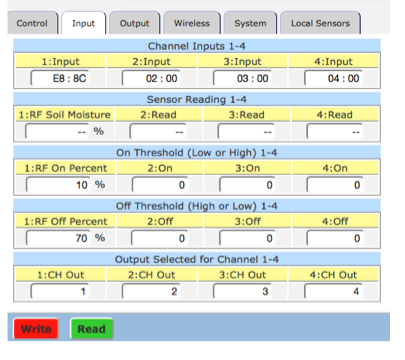 In this example, Input 1 is an RF Soil Moisture Sensor. Output 1 is wired to a fan to simulate a pump. When the soil moisture falls below 10% (dry), the fan will turn on. When the soil moisture rises above 70% (wet), the fan will turn off. The fan represents an electric irrigation pump, and it’s easy to see from the video that any type of irrigation pump could be automated in this fashion. The image on the right shows how simple it is to setup a threshold and map the Input threshold to the output (1:CH Out) which will turn on the pump.